I had never heard of v tea brand tea until recently. Looking them up, they had really high reviews. I was interested to know more. Turmeric tea, being one of the best teas available, was my go to. Tureric has so many great health benefits. It also tastes great. V tea is a great option that is really cheap to order and is American made. With all the great benefits of v tea Turmeric Spice Anti-Inflammatory Tea has to offer, it is nearly irresistable. Is it the right tea for you though? I'll give you some info and help you make that decision. When it comes to tea, you need to decide what you like. 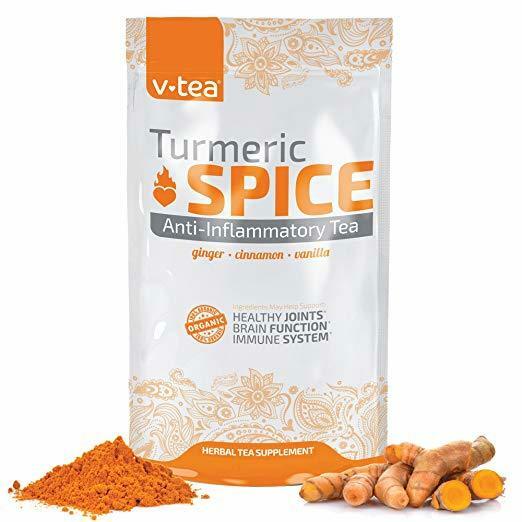 V tea Turmeric Spice Anti-Inflammatory Tea combines a few beneficial ingredients to make a tea with incredible quality. If you don’t buy a high quantity, you will be paying quite a bit. While the bag looks kind of bland or like chemicals, it is what is inside that makes all the difference. The tea bags are shaped like pyramids though, and each cup is going to cost you about a dollar. The real question is if v tea Turmeric Spice Anti-Inflammatory Tea is worth it. Turmeric teas are pretty great tasting. This one is based in red rooibos tea ingredients, which gives the turmeric a delicious base. The turmeric, ginger, and cinnamon give it a nice spicy flavor that is extremely palatable. Turmeric is super healthy and full of antioxidants. Turmeric is the key in this teas main health benefits. It is proven to reduce inflammation in the joints. Reducing inflammation can reduce pain from arthritis and sore joints from working out. Turmeric can also boost the amount of antioxidants that your body can absorb. Turmeric has, in some studies, shown to provide a reduction in depression. Not only are all of the ingredients 100% natural, the majority of them are also certified organic. Many teas we have featured here are not actually organic, so it is always a great sign when we find one that is. In addition, root teas offer enhanced benefits because their ingredients are super concentrated. This tea can stimulate antioxidant activity in the body, prevent cancer, soothe inflammation, and promote good digestion. Plus, the ginger helps with nausea, digestion, prevents chronic diseases, and increases the appetite. Herbal teas, in general, have a lot of great benefits to them. Regardless of the type of herbal tea you are drinking, there are some things that you will take advantage of. One benefit that you will get from all tea is weight loss. Now, this is not like the tea will burn off fat. Rather, the best herbal tea will remove water retention, so you will visibly look slimmer because you will lose a lot of your excess water weight. Another great thing about herbal tea is that you get a access to a wide variety of antioxidants, vitamins, minerals, and other nutrients. Because herbal tea often features a combination of herbs, you are able to take in a variety of great things that can be highly beneficial to your body. Other common health benefits of the best herbal tea include relaxing the body and mind, aiding in sleep disorders, reducing inflammation, easing various pains, protecting against common diseases like the cold or flu, boosting the immune system, regulating the digestive system, and stimulating cognitive function. v tea Turmeric Spice Anti-Inflammatory Tea gives you not one, but two highly beneficial ingredients, ginger, and turmeric, which both have various beneficial properties that your body can take advantage of. V tea is probably one of the best teas we have featured on this list.The ingredients in their V tea Turmeric Spice Anti-Inflammatory Tea are all top grade, but the price is a little high. At about a dollar a packet, it is one of the most expensive teas I have recently reviewed. However, the tea is great quality and certified organic, so you are getting quality over quantity. V tea is a pretty tough company to find out about. Some of the good things about this tea reflect the company. This tea is full of all organic ingredients. Much of the ingredients are some of the most high-quality ingredients around. The best part is that the tea is made in the United States. Also, the product is one hundred percent guaranteed by the company. I love when companies give this type of guarantee. It proves the quality of the tea and the confidence of the company. If you are looking for top quality, 100% organic tea, v tea Turmeric Spice Anti-Inflammatory Tea has got you covered. Turmeric is highly beneficial. It is mainly used to stimulate antioxidant activity in the body, prevent cancer, soothe inflammation, and promote good digestion. Plus, the ginger helps with nausea, digestion, prevents chronic diseases, and increases the appetite. Some people have mentioned that the taste is a bit lacking. V tea Turmeric Spice Anti-Inflammatory Tea Tea offers the best quality tea possible with 100% organic and fresh ingredients. This stuff will give you exactly what you want it to with its antioxidants and other various benefits. Typically the taste of ginger and turmeric is very noticeable and enjoyable. However, some have stated that whether it was a bad batch or an issue with the seller on Amazon, the taste was rather weak and not as potent as it should have been. This also could have been user error and they may have not steeped their tea long enough. Overall, v tea Turmeric Spice Anti-Inflammatory Tea is a great quality tea. Hopefully, those who had issues with the taste just had bad batches, and that seems like the case, seeing as the majority of people absolutely love this tea. If you want to try it out for yourself. It may be a little expensive, but it will definitely be worth it. For more information, including the best herbal tea buyers guide, check out the rest of Green and Growing. Here are some top questions that I found for people seriously considering buying the v tea Turmeric Spice Anti-Inflammatory Tea. Is this tea organic? Yes! All the great ingredients are entirely organic.